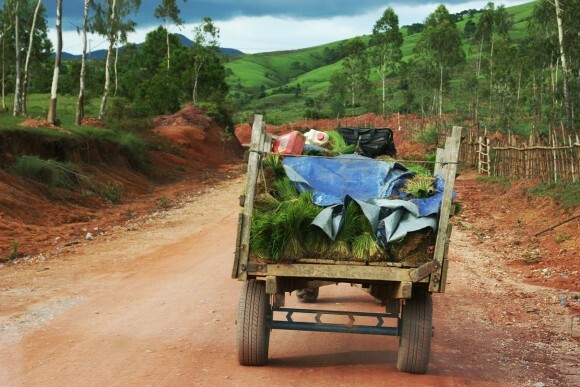 The rural road out of Phonsavan quickly turned to red dirt. 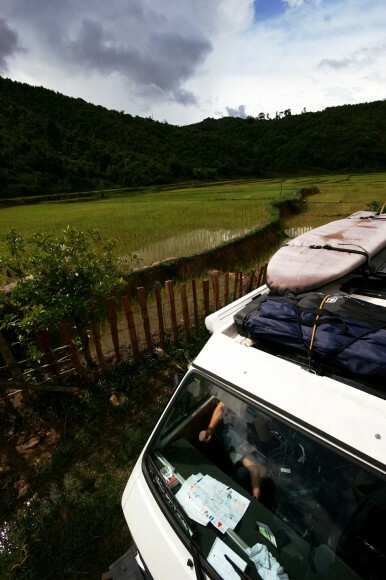 It was smooth and fast, but given Laos’s insane population of livestock, we had to remain on guard for suicidal cows and sleeping dogs. The monsoon skies were moody and it was anybody’s guess when the dark clouds would burst like water balloons and fall upon the radiant green sticky rice fields. 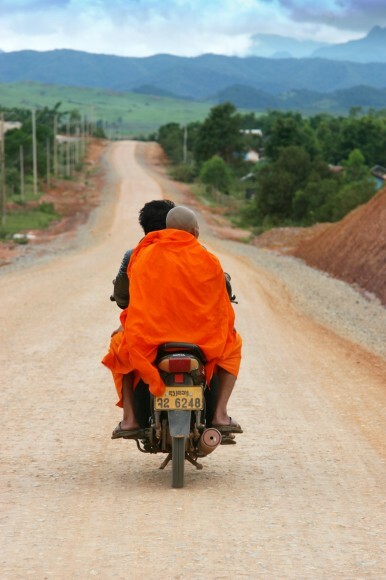 As I expected the monk led us directly to the temple and hence to our destination. 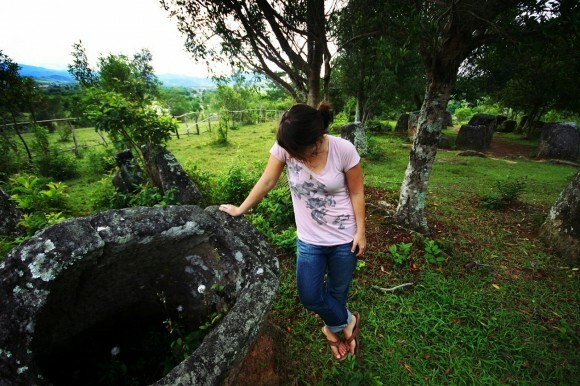 The temple shared a parking area with the Plain of Jars site #3. We made it here after all—despite the highway 7 road bandits and the scare they caused us a couple of weeks prior. 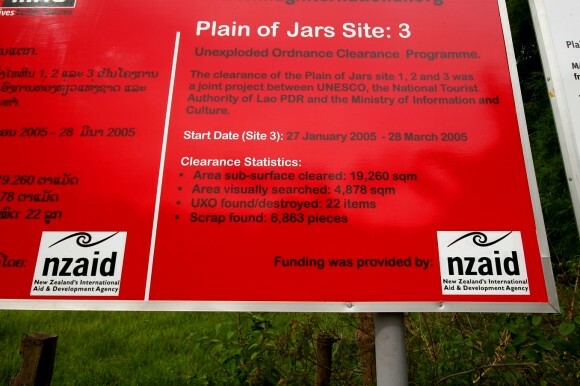 A big red sign sponsored by an NGO provided some statistical information on the area; in 2005, 6,863 pieces of scrap metal and 22 pieces of unexploded ordinance, or UXO, had been cleared from the area surrounding the jars. 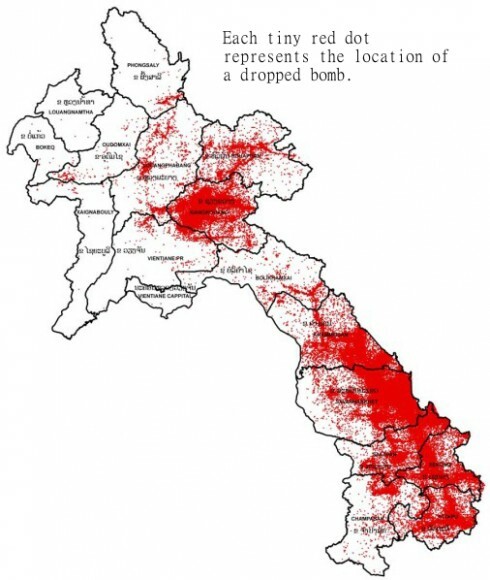 While this seemed like an awful lot of bombs to find in such a small area, it was nothing compared to the untold millions of them still scattered throughout the country. 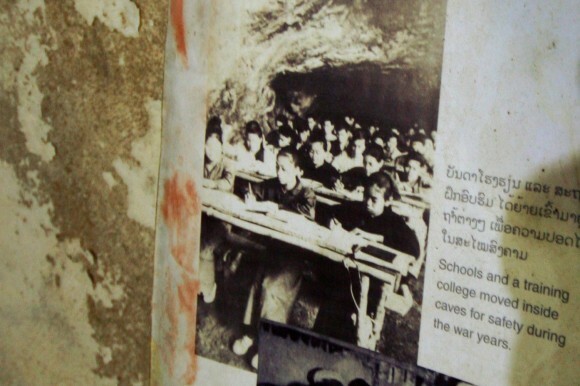 After traveling to Laos it became apparent that my schooling had failed to bring to light this dark piece of American-Laotian history: the CIA’s Secret War. It was indeed my country that created this nightmare of a scenario; between 1964 and 1973, America’s military dropped 80 MILLION bombs on Laos—killing some 350,000 men, women, and children and uprooting a tenth of the population. This was far more bombs than the U.S. dropped on both Japan and Germany during World War II. Seventeen bombs per minute for nine straight years rained down on innocent civilians who knew not even what America was. And of these 80 million bombs, 24 million didn’t even go off. 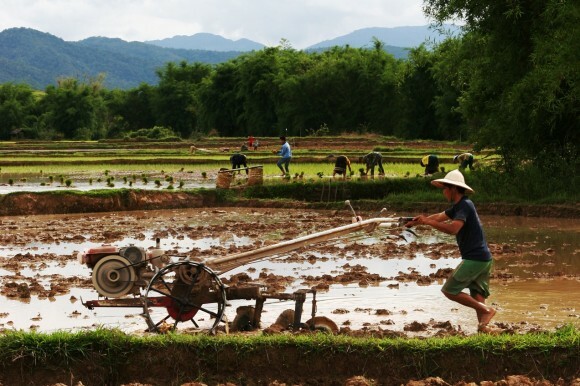 This has left Laos, 40 years after the war, still dealing with the aftermath of America’s distaste for their choice of political system and its unfortunate proximity to Vietnam. To this day 100 people die every year, 40% of whom are children, from unexploded ordinance. 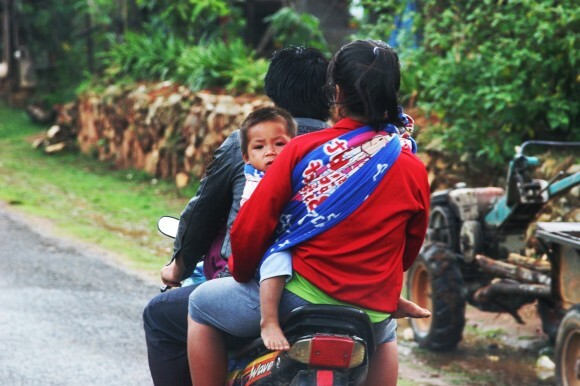 One of the most highly bombed regions in Laos was in the North, in a place we had just come from. 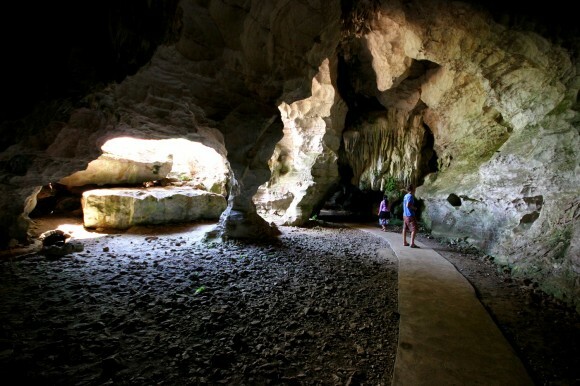 The Laotians in this region cleverly opted to spend the war years living in the region’s vast limestone cave systems. 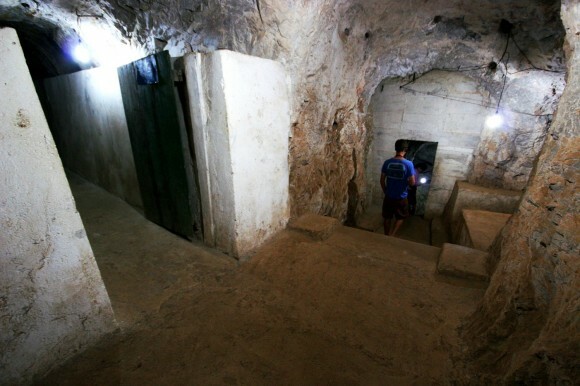 One such cave—Vieng Xai—became a safe haven for 20,000 villagers. And if one could forget for just a moment the terrible fact that bombs were dropping from their skies like raindrops, the whole network of tunnels, kitchens, assembly rooms, schools, and sewing rooms were utterly fascinating. So the big red signs we saw all over the countryside weren’t surprising anymore. They also unfortunately created a constant reminder that any place without them could be littered with UXOs. Bomb clean up is a slow process and unfortunately, while the tourist sites receive much attention from NGOs, many other places in the country do not. From the temple parking lot a local pointed to a bridge that led us through a thicket of tall bamboo branches. 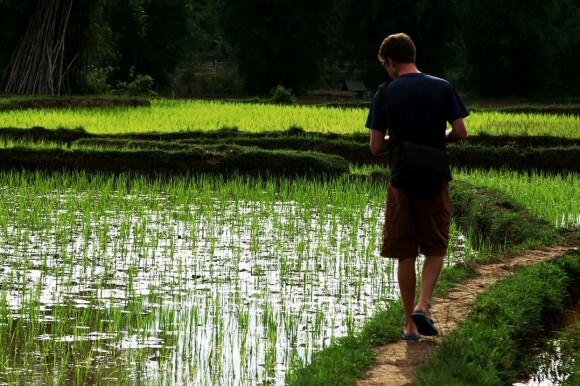 The bridge ended at the spine of two rice fields and we walked between them. These fields were just two out of the dozens that connected and ran down the valley. 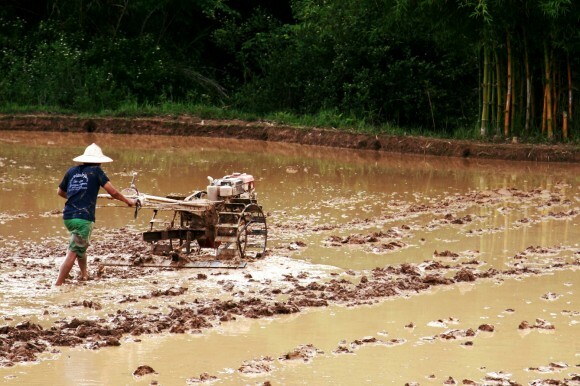 Field workers crouched over in rows and planted rice saplings while in the next field over a man up to his knees in mud and water pushed a tilling machine. Aside from the mechanized tiller, very little about the scene unfolding before us had likely changed much at all over the last 30 years. We watched the rice workers while they watched us. They were our entertainment and we were theirs. Past the rice fields the area opened up into a hilly grassy meadow and at the top within an outcropping of mature trees was the Plain of Jars site #3. 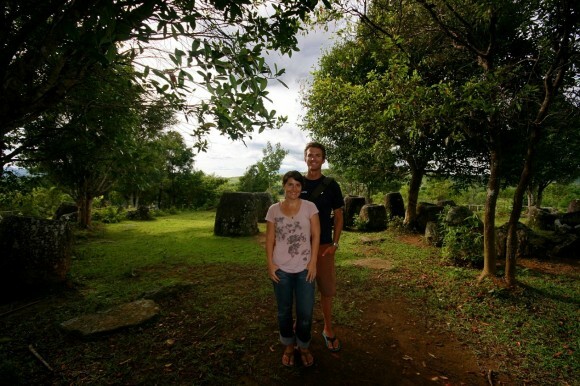 We wandered amongst the ancient stone jars, amazed by the site and its accessibility for anyone to explore. 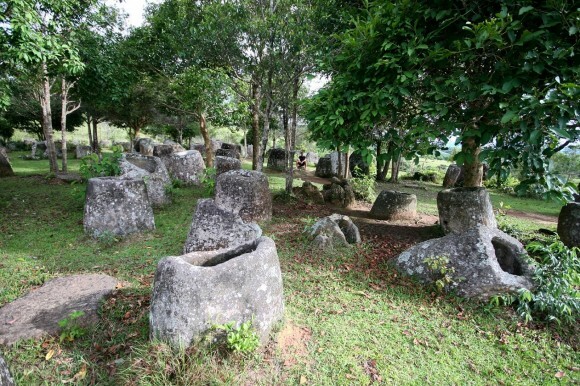 Actual historical knowledge of the site is sparse but it is believed that the Plain of Jars dates back to the Iron Age (2,500 years) and that the jars were made from solid rock and used as burial urns. The jars vary in size from around one to three meters in height, and it’s believed that the dead were first placed in the larger jars for distillation, ensuring a gradual transformation from the earth to the spiritual world, and then placed in the smaller vessels for cremation. All of the jars have lip rims, so it is also assumed that at one time they all had lids, although few have been found. 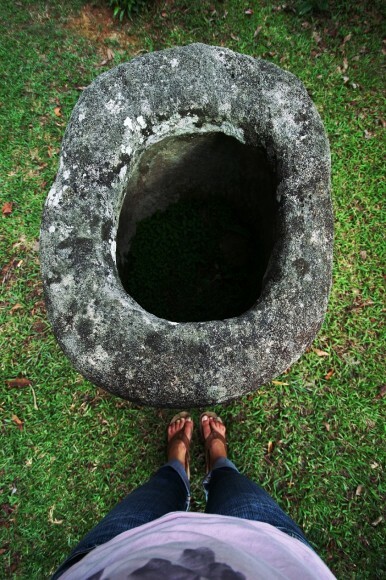 This suggests the lids were made of perishable materials and did not survive the years. Local legend has it that the jars were made for the mighty Khun Cheung, who after a long, hard, and victorious battle, needed them for brewing and storing his supply of rice beer. 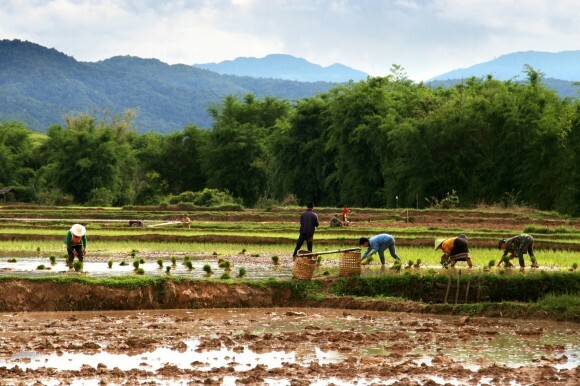 We think Laos deserves a bit of hard won leisure—a moment to kick up its feet and get lost in a victorious rice beer—so we’ll just stick with the legend. Beautiful pictures, thanks for sharing. Miss you guys. @John: I definitely appreciate you pointing out my error–thank you! I didn’t have all of the information I needed when writing this story. 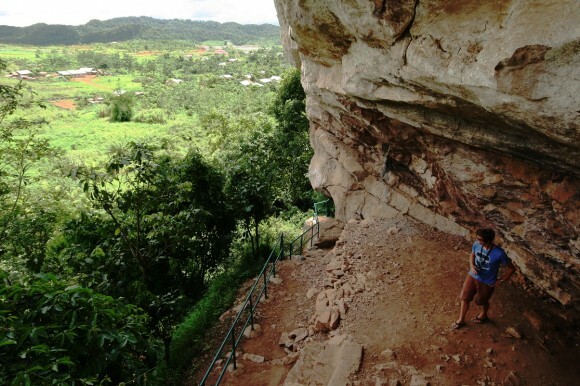 It was the Vieng Xai caves. I find it fascinating to read first hand observations from Americans overlanding in distant lands and who are awe struck at what horrific deeds were carried out by America simply because of differing ideology and political views. Just the thought of someone authorizing 80 million bombs to land on the heads of people that could hardly feed themselves speaks volumes. It would take some very sick people to make that decision, in my mind. Twenty four million bombs still remain unexploded should be a concern for all mankind and I am flabbergasted that America remains one of the few countries that has not signed the treaty to ban landmines and buried arsenal introduced by Canada. Wow! I can see why not? When will warmongering for ideological reasons stop, I wonder? As I write this, plans are under way to go blow up Syria. As if, not enough people, like in Laos, who have suffered in Iraq or in Afghanistan.. Sorry Brad…I could not help speaking because , perhaps like you, I do wish to see the vast rainbow of humanity away from my shores that essentially plays no part in the shenanigans of the Politicians in their masters with hegemonic delusions. Keep well and keep on trekking you beautiful people and change the world to love and not hate. I wholeheartedly agree with you, Mashoud. When we started our trip I considered myself fairly up-to-date and informed, politically. I felt like I was able to see the world through objective eyes. Over the last 20 months (whoa!) I’ve undergone a fast and thorough reeducation about global politics. As a part of that, I’ve come to realize that it doesn’t matter which party is in power in America, our government’s decisions are dictated by much more selfish and deep-seated reasoning. Yes, we are about to bomb Syria. And you can bet that in the end the country will be decimated and in shambles for generations to come, but America will come out with renewed oil promises, we’ll have made a great deal of money, and the new regime will be pro-Israel and anti-Iran. I hesitate to talk too much politics on our blog, but it gets harder and harder as we get into regions that have suffered because of us. I am truly saddened by what I’ve learned. By the way, Sheena deserves the credit for this blog. Thanks for the message, and keep on keepin’ on. Politics aside for a moment. You reference the funding provided by the New Zealand’s International Aid and Development Programme for the cleanup in one area and then you talk about the sign erected by an NGO. NGO is non-government organization, yes? Unless you’re saying the sign was provided by someone other than the cleanup? I’m a bit confused. By the way, I’ve seen NGO referenced elsewhere in your writings. Do you mean it to have a different definition than I think it has? 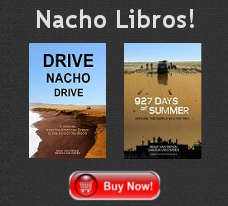 All that aside, I had fallen out of the habit of routinely reading the adventures of Nacho and his two human sidekicks but caught up over the last few days. I’ve missed you and its been great to catch up. Watching you from afar and wishing you many more happy adventures! Keith, since the buried bombs are so widespread, varying groups adopt different sites for clearing. 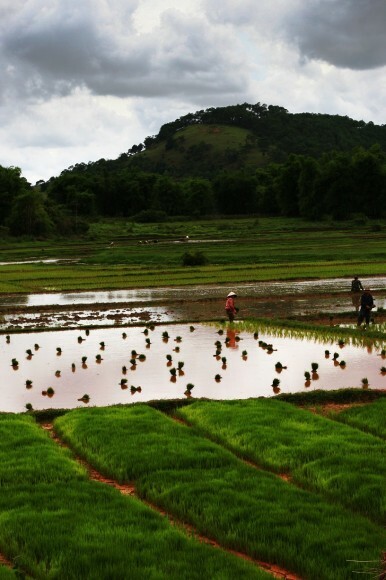 The organizations range from government aid programs to NGOs. 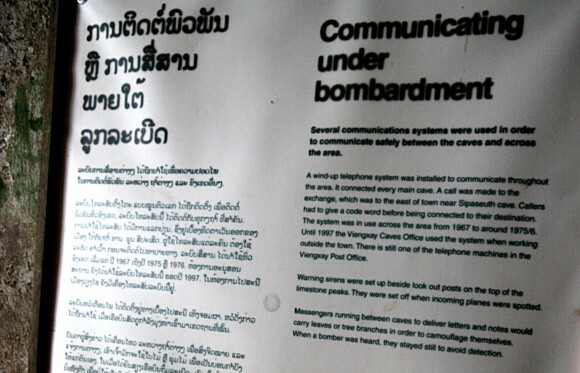 The American government, for example, has pledged $54 million over the last 40 years for bomb clearing in Laos. For context, that’s the cost of 3 days of bombing. 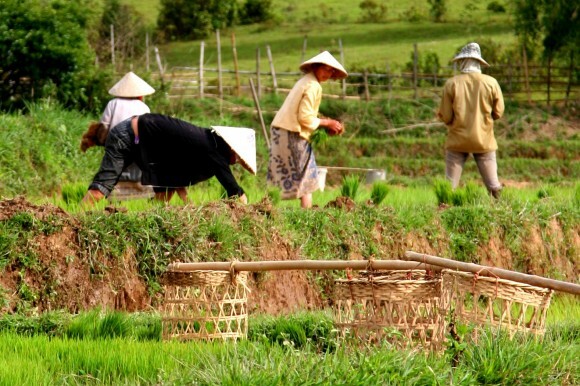 NGOs play an important role in taking up the slack. I have been a teacher for years, albeit in the elementary and middle school classrooms—not high school where more in-depth social studies is covered—and I continue to be in awe at the gross deletion of true facts surrounding our ancient AND recent world and American history. Thank you, Sheena, for supplying us with facts, right there at ground zero.